A protein released from parasitic worms that can be used to limit asthma in people has been identified by researchers. Carried out by the University of Edinburgh, researchers used mice to demonstrate the protein called Heligmosomoides polygyrus Alarmin Release Inhibitor (HpARI) suppresses the effects of allergic reactions, such as asthma. 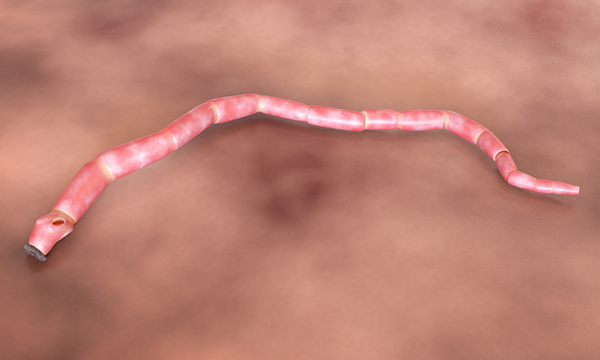 People who live in countries where parasitic worms are common are less likely to have asthma. In South East Asia less than one in 20 people have asthma as diagnosed by a doctor, whereas in the UK one in 11 people have the condition. The study was conducted on male and female mice that were bred in-house, but the lead researcher demonstrated that the findings could be applied to human lungs. Non-cancerous adjacent tissue from lung cancer patients were used as part of the study. Researchers are hoping that these finding will lead to scientists using this protein as the basis for asthma treatments. Lead researcher Henry McSorley, who led the research with Rick Maizels, said: ‘We have known for some years that infections with parasitic worms appear to protect people against asthma. Osbourn M, Soares DC, Vacca F et al (2017) HpARI protein secreted by a helminth parasite suppresses interleukin-33. Immunity. 47, 4, 739-751.